President Donald Trump made the surprise announcement Friday that he was cancelling a new round of sanctions intended to target North Korea announced only 24 hours earlier by his own administration. "It was announced today by the U.S. Treasury that additional large scale Sanctions would be added to those already existing Sanctions on North Korea," Trump tweeted after arriving at his Mar a Lago club in Florida. "I have today ordered the withdrawal of those additional Sanctions!" (Evan Vucci/AP) President Donald Trump meets North Korean leader Kim Jong Un, Feb. 27, 2019, in Hanoi. White House press secretary Sarah Sanders confirmed the president's announcement in a statement, citing his personal friendship with the North Korean dictator. "President Trump likes Chairman Kim and he doesn’t think these sanctions will be necessary," Sanders said. The Treasury Department just Thursday had announced the round of sanctions targeting two Chinese shipping companies that it said have helped North Korea evade sanctions. The tweet marked a stunning and major policy reversal of the first round of sanctions targeting the regime since Trump's failed Hanoi summit with Kim last month. In a tweet following the original sanctions announcement, President Trump's national security adviser John Bolton highlighted the move as an "important" step and warned other countries against similar actions to aid North Korea. The announcement isn't the first time that President Trump's personal affection for Kim has resulted in a policy that appears to runs counter to his own administration. 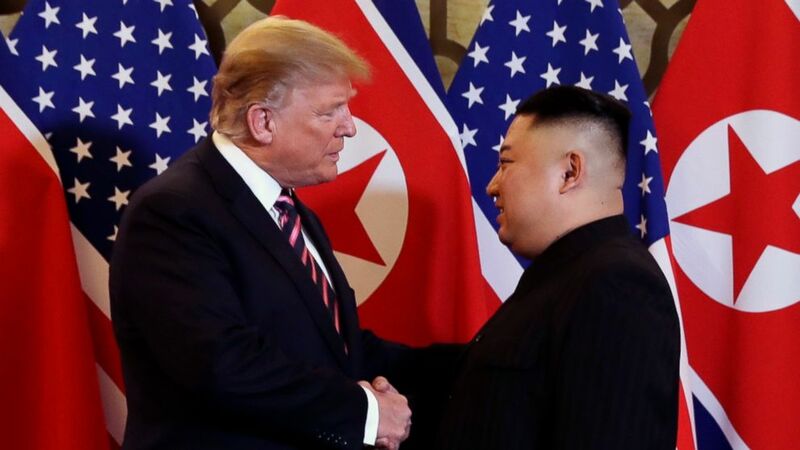 Trump ignited controversy in a press conference following his Hanoi summit with Kim when he told reporters he didn't hold Kim personally responsible for the death of American student Otto Warmbier in 2017. "I don't believe that he would have allowed that to happen," Trump said. "He felt badly about it. He knew the case very well, but he knew it later." Bolton in an interview declined to say whether he shared the president's view on Kim's culpability, after the Warmbier family rebuked the president's comments in a statement. ABC's Jordyn Phelps contributed to this story.